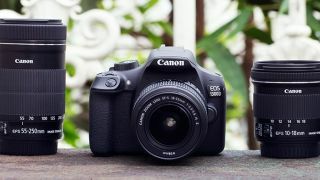 DSLRs don't come much more affordable than the Canon EOS 1300D, also known as the EOS Rebel T6. For less than £300, you can get yourself a solid performer that outguns more expensive compact cameras. And we'll make sure that you get the best deal and don't pay over the odds. If you've been tempted for a while now to dip your toe into the DSLR waters, we can see why you've ended up looking at this Canon camera. The EOS Rebel T6 / EOS 1300D is a cheap but dependable entry-level DSLR for aspiring snappers. With its 18MP sensor and clear viewfinder, you'll soon be creating images of excellence. Although we'd hardly say it's jam-packed with features, the presence of Wi-Fi and NFC are a welcome touch. But if you're an intermediate user wanting to push things to the next level, then we recommend you keep hunting Digital Camera World's buying guides for something more advanced. You can learn more about the EOS Rebel T6 / EOS 1300D's specifications below. And then check out our dedicated widget at the bottom of the page to discover the best prices on the market right now.